While Woody Guthrie was the great pioneer of the folk movement, he was always willing to champion other musicians. Through the years, he collaborated with such noteworthy artists as Leadbelly, Cisco Houston and Pete Seeger, befriending them all. 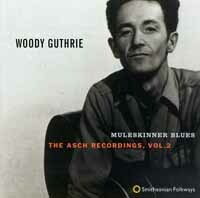 The second of a four-disc compilation put together by Smithsonian Folkways, Muleskinner Blues features Guthrie performing the songs of his contemporaries and influential predecessors. As with the other albums in the series, its songs – 23 in all – are taken from 1940s sessions recorded by Folkways founder Moses Asch. Muleskinner Blues is certainly an enjoyable album. Guthrie’s performances are stellar, as he makes these songs his own. But while the recordings are extremely well-done, the collection as a whole lacks the edge of Guthrie’s best work. The album opens with a cover of Jimmie Rodger’s bluegrass tune “Muleskinner Blues,” with Houston and Seeger playing backup. Guthrie takes out the yodeling of the original and sings it with a perfect mix of anguish and sarcasm. Still, it isn’t a particularly strong song to begin with, making it an odd choice for the collection’s title track. Next comes a take on “Wreck of the Old 97,” by Henry Whitter, Charles Noell and Fred Lewey. This track is right up Guthrie’s alley – a Casey Jones-esque tale of a train engineer who wrecks while late on his route. Some of the album’s best tracks also focus on loss. “Who’s Gonna Shoe Your Pretty Little Feet” is an adaptation of an old Scottish folk tale about a wife whose husband leaves. “Poor Boy” is tells of a man sentenced to 99 years in prison. Guthrie’s rendition of “Put My Little Shoes Away,” sung from the viewpoint of a dying child, is heartbreaking. The child urges his mother to “tell my darling little playmates that I never more shall play,” as Guthrie’s voice cracks at all the right moments. J.O. Webster’s “Stepstone” is a poignant song on aging and moving along, and it perfectly fits Guthrie’s vagabond songwriter image. The longing in his voice and the sad notes of his mandolin embody the feeling of youth lost. All these songs, many of which Guthrie incorporated into his radio act in the 1930s, combine to form an interesting collection. For the most part, the pieces Guthrie sings here go hand-in-hand with the styles he mastered in his original tunes. While this album does not represent Guthrie’s best work, it does provide some insight into his personal tastes. That, along with the sheer quality of the performances, makes Muleskinner Blues worth owning.